Terriers travel to #8 Providence for their third meeting of the year with the Friars. BU goes into the 7 p.m. game tied with Maine for fifth place in Hockey East, three points behind Northeastern and Lowell, who are tied for third. After tonight's game, BU will have two games left on its regular-season schedule: Saturday's home game against Merrimack and a road game against Maine a week later. PC shut out BU, 5-0, in October and the Terriers rallied for a 4-3 win last month on third-period goals by David Farrance and Logan Cockerill. The Friars’ offense is led by junior Josh Wilkens with 30 points, freshman Jack Dugan (30), junior Brandon Duhaime and junior Kasper Björkqvist (25). Hayden Hawkey leads all Hockey East goalies with a 1.82 GAA. BU’s defense corps boast the conference’s top three shot-blockers: David Farrance (66), Kasper Kotkansalo (61) and Cam Crotty (58). Over his last four starts, goal Jake Oettinger has two shutouts and has yielded just four goals. He was co-winner of Hockey East's Defensive Player of the Week award for his efforts in the sweep of Vermont. The game will air live on NBC Sports Boston and can be seen on Friars All-Access (PPV). 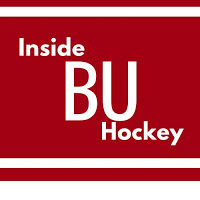 This Week’s episode of Inside BU Hockey features Bernie Corbett’s interviews with Head Coach Albie O’Connell and junior forward Patrick Harper, who has scored twice in the last four games. His goal against Vermont last Saturday—a slick passing play with Patrick Curry—was the NCAA #5 play of the week. 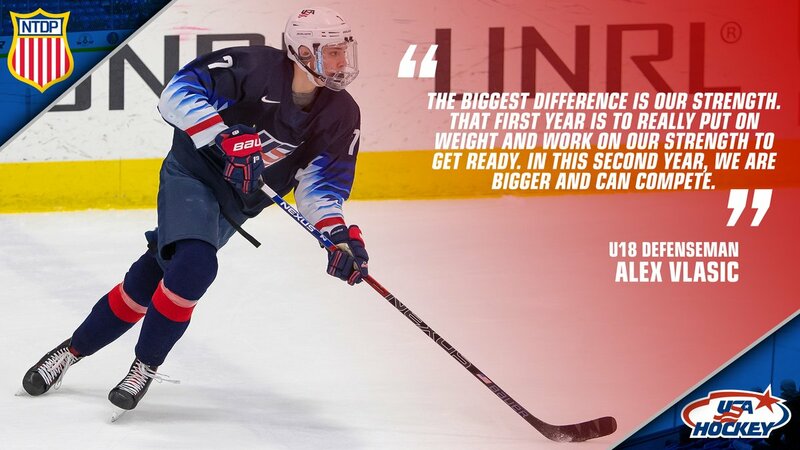 2019 recruit Trevor Zegras scored a goal and assisted on two other scores as the NTDP U18s blitzed Central Illinois, 11-2. Defensemen Alex Vlasic and Dom Fensore each picked up an assist. Fensore was +6 on the night. Zegras currently leads the U18s in scoring with 63 points (19G, 44A) in 44 games. 2020 recruit Cade Webber scored a shorthanded goal in The Rivers School’s 5-4 overtime win in the New England Prep Small School playoffs. The Red Wings, coached by former BU All-American Shawn McEachern, advance to the semifinals as does St. Mark’s, coached by another former BU captain, Carl Corazzini. 2020 recruit Liam Connors scored a shorthanded goal for St. Sebastian’s in the Arrows’ 3-2 loss to Dexter in the Elite 8 division playoffs. David Warsofsky and AJ Greer each scored a goal for the Colorado Eagles in a 6-0 blanking of San Antonio. Greer, who recently scored his first NHL goal, also recorded an assist. Joel Farrabee’s goal in the final minute of regulation gave BU a 2-1 win over Vermont and a sweep of its weekend series in Burlington. With the victory, BU remains tied with Maine for fifth place in Hockey East and just two points behind Providence for the final home ice slot. Vermont took a 1-0 lead on a first-period power play when Joey Cipollone slid home a rebound after Jake Oettinger made the initial save. The goal ended Oettinger’s scoreless streak at 127 minutes. 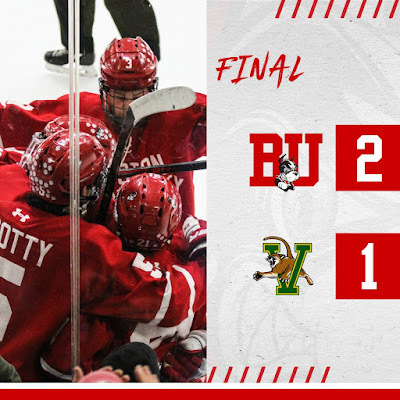 BU knotted the score late in the second period on a classic give-and-go sequence with several passes on the rush by Patrick Harper and Patrick Curry before Harper beat Stefanos Lekkas to the glove side for his fourth goal of the season. The game appeared to be heading to overtime when Logan Cockerill passed to Farabee at the top of the right circle. The freshman eluded a Catamount defender, skated toward the slot and ripped a shot over Lekkas’ blocker with 57 seconds left in regulation. Kasper Kotkansalo also assisted on the play. Oettinger stopped 19 Catamounts shots in the win and 48 of 49 in the weekend sweep. In his past five games against Vermont, the junior netminder has allowed only two goals. Coach Albie O'Connell praised Oettinger's performance as "dynamite," adding, "they scored a rebound goal where we just missed coverage. He (Oettinger) didn't make a mistake all weekend. O'Connell also complimented the play of David Farrance, who returned to the line-up after being "banged up" and missed Friday's game. The coach noted that co-captain Bobo Carpenter has been skating and should return to the line-up soon. After ending a six-game losing streak last weekend, BU has now won three games in a row. 2019 recruit Robert Mastrosimone assisted on the overtime game-winner as Chicago defeated Tri-City, 4-3. The assist extended his points streak to 12 games and his season total to 41 points in 37 games. With two assists in Buffalo’s 5-2 win against Washington, Jack Eichel set a new career high with 66 points. Evan Rodrigues also recorded an assist for the Sabres whose lineup also included recent call-up Danny O’Regan. 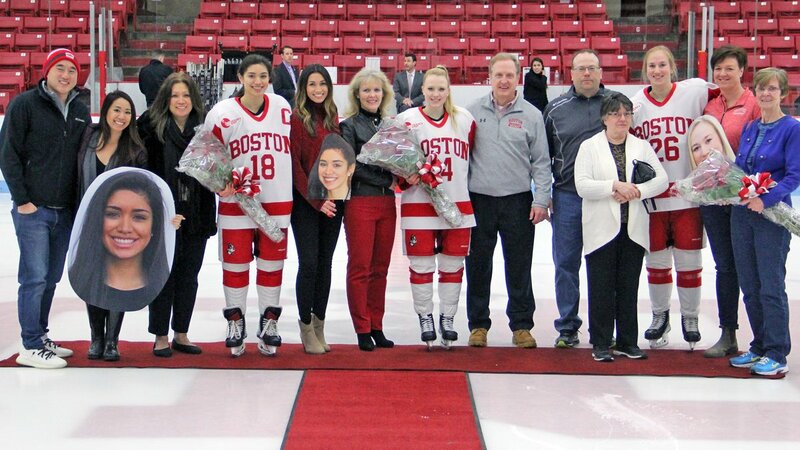 #8 Terriers dropped a 2-1 decision to Providence in their Senior Day finale. The loss ended a 14-game unbeaten streak for BU, which finishes third in Hockey East. The Terriers hadn’t lost since Jan. 5. BU had taken a first-period lead on the power play when Natasza Tarnowski converted a Reagan Rust pass to her at the right post. Abby Cook also assisted. The Friars scored a power play goal early in the second period and tallied the eventual game-winner midway through the period. Goalie Corinne Schroeder stopped 27 Providence shots. BU, which honored seniors Rust, Mary Grace Kelley and Connor Galway prior to the game, will host New Hampshire next weekend in the best-of-three conference quarterfinals.